To Lighthouse Trails: Please listen to the sermon dated August 21st [at Grace to You]. I was shocked when John MacArthur promoted Dallas Willard. Has anyone else contacted you concerning this endorsement? After receiving this letter, we found the August 21st 2013 Grace to You sermon broadcast (link removed but sermon still on Grace to You website) by John MacArthur, where MacArthur favorably quotes contemplative pioneer Dallas Willard (who passed away earlier this year). While researching this situation, we learned that this sermon was first aired in 1989. However, Grace to You (MacArthur’s ministry) has been presenting it for a number of years as part of a series called Faith Through the Fire. While MacArthur’s original citing of Willard in this sermon took place many years ago, the fact that it is still being offered at Grace to You in a sermon series and is being broadcast currently is cause for concern and is the reason we are writing this report. 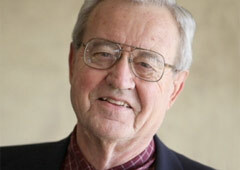 It is hard for us to understand why Grace to You would continue using this particular sermon, knowing how pervasive the Spiritual Formation (i.e., contemplative prayer) movement is today in the evangelical Protestant church; and as we will show below, even John MacArthur acknowledges that Dallas Willard is a key figure in that movement. We are well aware that many Christians have a strong sense of devotion toward John MacArthur and trust his opinions and teachings. It is not our intention to discredit him; however, as we have consistently done now for 11 years, we are compelled to issue a warning to believers and a challenge to Christian leaders. Are we suggesting that John MacArthur is a contemplative prayer advocate or part of the emerging church? Certainly not! Are we saying it is wrong to use a broadcast today where Dallas Willard is quoted in a positive manner, giving credence to the man and the movement? Yes, we are saying that is wrong. Willard is largely responsible, along with Richard Foster, for bringing the contemplative prayer movement to the forefront of evangelical Christianity. Those reading this who wish to defend MacArthur and Grace to You, saying that there is no issue here because the original sermon was so long ago need to understand that if this sermon were sitting in some obscure archive, stored away for no one to see, we wouldn’t be writing this today. But that is not the case. Grace to You is continuing to use a sermon that should have been discarded years ago , and it must be treated as if it were new material because that is how it is going to be looked at by those who heard the recent broadcast and also by those who buy the Faith Through Fire series. The section of the August 21st sermon begins at about the 17:35 minute mark of the broadcast. MacArthur begins by talking about the spiritual disciplines and how they are important for the believer’s life to battle crises and hard times in our lives. He then quotes Willard and says the quote is from Willard’s 1988 book The Spirit of the Disciplines. The “on the spot” episodes [crises] are not the place where we can, even by the grace of God, redirect unchristlike but ingrained tendencies of action toward sudden Christlikeness. Our efforts to take control at that moment will fail so uniformly and so ingloriously that the whole project of following Christ will appear ridiculous to the watching world. We’ve all seen this happen. The secret of being ready for the crisis of having the yoke be easy and the burden be light is to learn how to live the Christian life all the time so that we have developed the habits, the resources, the responses, the timing, the strengths, the memory, the faith, the spiritual courage to handle it. That’s the issue. To behave like Jesus Christ is our goal. But to be able to do that is not the result of wishing. It’s the result of daily spiritual discipline. Paul concludes chapter 2 with a description of spiritual disciplines that were being used in that day (vs. 20-22), only to say that such things “have indeed a shew of wisdom in will worship, and humility, and neglecting of the body” (vs 23), but only serve to make men proud. In silence we close off our souls from “sounds,” whether those sounds be noise, music, or words. . . . Many people have never experienced silence and do not even know that they do not know what it is. . . . It is a powerful and essential discipline. Only silence will allow us life-transforming concentration upon God. (bold added, 1991, First HarperCollins Paperback Edition, p. 163-164). Clearly, Willard is not talking about a quiet surrounding, as he says many have never experienced the silence. Everybody, at some time or another, has experienced being in a perfectly quiet environment. The fact that MacArthur has supported his sermon on spiritual disciplines and Christlikeness with quotes from Dallas Willard (specifically from the most problematic book, The Spirit of the Disciplines), we feel a sense of duty to put forth this challenge. The premise of the Spiritual Formation movement is not focused on the person of Jesus Christ, the born-again experience, or the life of Jesus Christ in the believer Who is the power behind true Christlikeness but rather is focused on the practice of spiritual disciplines. It is a very works-based belief system that zeros in on mystical practices. What we primarily want to discuss in this article is Dallas Willard and his book, The Spirit of the Disciplines. We think when you see the evidence, you will agree that Dallas Willard should not be favorably quoted. If you have been reading Lighthouse Trails for some time, you may know that we have discussed this book on a number of occasions. The book is filled with references to and quotes by numerous contemplative figures including universalists and interspiritualists (e.g., Nouwen, Merton, Meister Eckhart, George Fox) as well as some names that would fall in the New Age/New Spirituality camp (e.g., Agnes Sanford and M. Scott Peck). And in the bibliography, there is The Cloud of Unknowing, the Desert Fathers, atonement denier Harry Fosdick, Ignatius of Loyola, Carl Jung, the mystic philosopher Soren Kierkegaard (whom MacArthur also quotes in the sermon and is addressed in Faith Undone), Evelyn Underhill, and Teresa of Avila. All of these names are in Willard’s book for one reason only – because he resonates with their spiritual viewpoints. And while The Spirit of the Disciplines was released back in the late 80s, Willard has maintained his affinity with most of these figures. On Willard’s website, he recommends many of them as viable resources for spiritual growth. That list of recommended reading has been on his website for many years and remains there today even after his death. I bumped into the classic spiritual disciplines while taking a course called “Dynamics of Christian Life” in my second year of Bible school. One of our textbooks was The Spirit of the Disciplines by Dallas Willard. The course and textbook only touched on the actual disciplines, but the concept captivated me. The following spring, I found a copy of Richard Foster’s spiritual classic Celebration of Discipline in a used bookstore. Opening it and discovering each discipline [including the contemplative] detailed chapter by chapter, I felt a profound sense of joy and excitement. I’d found a real treasure. The point here is that Dallas Willard has been a pied piper to countless people, leading them straight into the arms of mystical spirituality. What happened to Perschon and others like him is tragic. And we just cannot fathom the idea that not only will Willard’s influence continue on long after he has been gone from this planet but Christian leaders who should understand the dynamics of this movement will continue promoting him. It is in The Dance of the Dissident Daughter that Monk Kidd says God is in everything, including human waste! Sue Monk Kidd was once a Sunday school teacher in a conservative Southern Baptist church. She began reading Thomas Merton, started practicing contemplative prayer, and lo and behold, today she is a goddess worshiper who rejects and dismisses the Gospel of Jesus Christ. And herein lies our concern. And it’s been our concern for over a decade now. If Christian leaders point people to contemplative teachers like Dallas Willard, they are inadvertently pointing them to Thomas Merton and a myriad of other panenthestic figures. That is the plain truth! Frankly, we are surprised that the sermon by John MacArthur promoting Dallas Willard is still in active circulation and that Grace to You recently aired it. It seems so out of character. Especially when you consider what MacArthur said in an interview two years ago. In the interview, MacArthur was asked what he thought about the contemplative prayer movement to which he replied, “That’s just a lot of bunk. . . . I don’t even know what they’re doing, and I don’t know what they come up with but all of that mystic stuff, Dallas Willard and others like him, confuse people because they use the name of Jesus and they talk about God and they use Bible verses.” So clearly, MacArthur sees Willard as part of this heretical movement. Lighthouse Trails hopes this is just a mistake. One last concern here. In the interview above, MacArthur states that he doesn’t “even know what they’re doing” in reference to the contemplatives. We wonder if perhaps MacArthur doesn’t fully understand this movement and its occult nature. Many people see the New Age, contemplative, mysticism etc. as something not to be too worried about and that it is frivolous and nonsensical (in other words, just the product of one’s imagination) but really, it is much more profoundly dangerous than that. As Laurie Cabot says, it is the heart of witchcraft. The Bible says there is a spiritual realm that is operated by Satan and his demons. However, many proclaiming Christians don’t believe that, and thus it is very difficult to persuade them that things like Yoga, Reiki, meditation, and contemplative prayer are indeed dangerous. But we are warned many times in Scripture about this evil spiritual realm. We are also told in Revelation that someday Satan will deceive the whole world (that’s a pretty wide scale deception! ), and the vast populations repented not of their sorceries (Revelation 9:21). These are serious times – they are perilous times (2 Timothy 3:1) – and Christian leaders and pastors need to be encouraged and exhorted to make no compromises when it comes to the Gospel. To wrap this up, some may defend what John MacArthur did by saying that what he quoted in Willard’s book was harmless and benign. But when someone, especially someone like MacArthur who is followed by so many, quotes or references favorably a figure whose main teaching and emphasis is unbiblical, it negatively impacts resistance to the deception more fully developed in a literary work. People start to have second thoughts. If MacArthur quotes from this book, some may say, then maybe it’s not that bad. Follow up to this article, click here. I’m attending a ‘free’ Seminary in Ansan, South Korea. We are using a book, “Life in the Spirit, Spiritual Formation in Theological Perspective. Edited by Jeffrey P. Greeman and George Kalantzis. I believe they quote Dallas Williard or in the same class some of the handout material quotes him. I’m wondering about this?